On this page, I have assembled some projects for both the NXT and the Boe-Bot. The projects/software is designed to show how we can use several different technologies to communicate and control your machine. Be sure to use the hardware and software libraries I recommend or your bot may not behave! All of this stuff has been developed on Windows 7 & Visual Studio 2010. The Embedded Compact 7 projects are created in Visual Studio 2008 Professional. The Netduino projects use .Net micro framework 4.2 from Microsoft. Kinect projects work for the Kinect for XBox 360 or Kinect for Windows. Robotics Developer Studio has been discontinued so you have to search for a copy. Check out these Electronics & Embedded Programming Books! 4- Run my app to control NXT with Power Functions remote. I use an ABE Bluetooth dongle on laptops without Bluetooth built in. This adapter is not sold by Lego anymore so search for one. If your new computer has bluetooth, you won't need this dongle. You can control the NXT directly from the LEGO-G software if you want to as long as your computer has bluetooth enabled. If you want to create custom apps, keep reading. Use DIGI X-CTU as the remote controller and interface to manage all XBee radios. The NXTBee module is designed for port 4 on the NXT only. You must configure both radios. I use DIGI X-CTU terminal program. Note: I tested the NXTBEE Pro's and they work for the Boe-Bot even though they are configured for the NXT. This C# program controls the NXT from an Ebox. C# program for controlling the Boe-Bot via XBEE's as described above. Try this GPS module from Parallax. 2- Download the documentation and example RobotC or NxC code. Check out the WiFi block here. 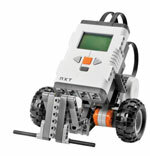 It will let us control the NXT with Lego-G blocks, Arduino, Robot-C and more! Get my WiFly.bs2 program here. You control it with TeraTerm through your home WiFi router/access point! WiFly module in XBEE form factor. Parallax XBEE SIP adapter for your BOE because it saves space on the breadboard. Connect Wifly to PC using a USB XBEE Explorer adapter like this. WiFly and XBEE's require 3.3V so you MUST use an adpater! Parallax also has one. 3-Run this app to read GPS on the NXT! Control switches/appliances/model trains/lights from a PC using the PowerSwitchTail II. Check out Netduino here. These boards add even more cool stuff to build! NetDuino Mini plugs into the BOE and replaces the BS2 module. You can then program it in either VB or C#. You must have .Net Microframework 4.2 for VS 2010 or 4.3 for VS 2012 in order to use VB. NOTE: Netduino mini modules with 4.2 firmware work just fine with VS2012 and MF 4.3 so you do not have to update the modules!! Hayden Donze's Kinect/NXT Demo shows how hand movements control the robot. Copyright © 1999-2018 Ronald P. Kessler, Ph.D.
My temp & humidity demo. Welcome to the Basic Stamp 2 closeup image.